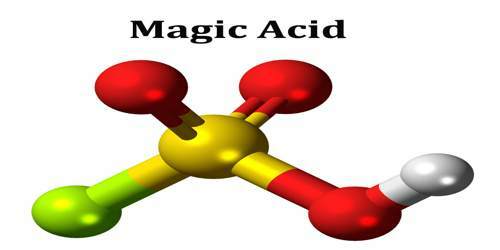 Magic acid is a superacid consisting of a mixture, most commonly in a 1:1 molar ratio, of fluorosulfuric acid (HSO3F) and antimony pentafluoride. It is a strong bronsted acid, one which releases proton very easily, that ionises and induces chainlysis in the hydrocarbon thereby dissolving it as Tertiary Butyl Cation. The antimony pentafluoride dissolved in hydrogen fluoride is the strongest known superacid, not the magic acid. Magic acid and other superacids are also used to catalyze isomerization of saturated hydrocarbons, and have been shown to protonate even weak bases, including methane, xenon, halogens, and molecular hydrogen. Magic Acid’s chemical formula is H2SO3F+, and is considered a “super acid” because of its strength (ie: it can dissolve a wax candle, something that even sulfuric acid cannot do). 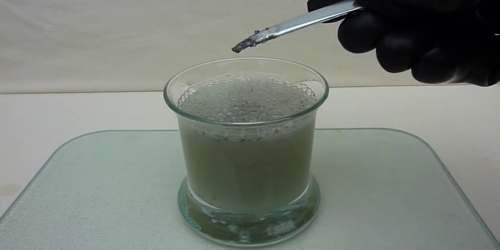 It can produce carbonium ions. Although a 1:1 molar ratio of HSO3F and SbF5 best generates carbonium ions, the effects of the system at other molar ratios have also been documented. When the ratio SbF5:HSO3F is less than 0.2. All proton-producing acids stronger than 100% sulfuric acid are considered superacids, and are characterized by low values of the Hammett acidity function. For instance, sulfuric acid, H2SO4, has a Hammett acidity function, H0, of −12, perchloric acid, HClO4, has a Hammett acidity function, of −13, and that of the 1:1 magic acid system, HSO3F·SbF5, is −23. 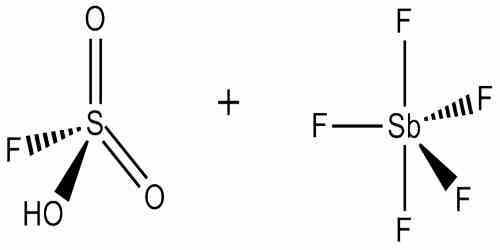 Fluoroantimonic acid, the strongest known superacid, can reach up to H0 = −28. The super acid and chemical industries, the most value, it is an inorganic and organic reagents of the proton, is highly active catalyst. In the past, many ordinary circumstances extremely difficult to achieve if not impossible to achieve the chemical reaction in super acid environment. Magic acid has low nucleophilicity, allowing for increased stability of carbocations in solution. The “classical” trivalent carbocation can be observed in the acid medium, and has been found to be planar and sp2-hybridized. Because the carbon has only six valence electrons, it is highly electron deficient and electrophilic. As use of the Magic acid system became more widespread, however, higher-coordinate carbocations were observed. Penta-coordinate carbocations, also described as nonclassical ions, cannot be depicted using only two-electron, two-center bonds, and require, instead, two-electron, three (or more) center bonding.